Here at GM Authority, we’re thankful for many things. The exhaust note of the Chevrolet Camaro ZL1, the Recaro seats of the Cadillac CTS-V, treads for the GMC Sierra, and fail videos demonstrating what not to do in a Chevrolet Corvette. 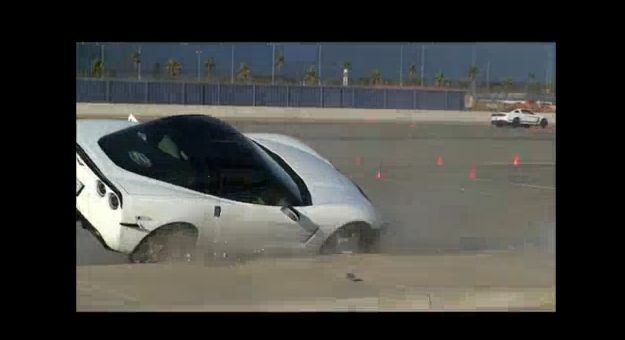 Appropriately titled the “Corvette Crash and Fail Compilation”, the video reminds us all of the consequences of hooning, both on the road and track. This video consists of at least half of all wipeouts, crashes, mistakes, and outright fail moments involving the Corvette on the internet. Probably. We’ve found the time to post several of the mess-ups here on GM Authority individually, but why do that when you can sit back and watch it all in eight minutes and 30 seconds of footage?! As our readers have pointed out, the language may be a tad harsh for some (perhaps NSFW). There, you’ve now been formally warned. If you want to race, get a race car and go to a track! Why do all corvettes dart to the left under uncontroled acceleration? actually nearly all high torque RWD cars do that. Covettes (and nearly every other domestic V8 pwr’d car) being blessed with naturally stout motors from the factory just tend to exaggerate the phenomenon all the more thanks to ease with which they pick up even more torque with each successive mod. newer IRS RWD cars (especially American ones) are now switching over to unequal diameter axles to eliminate the affect. This is why you might have all the money in the world to buy cars like this. but doesn’t mean you can drive them. Is there any video out there of a female crashing a car like this or is it just because we don’t tend to drive cars like this? I am sure it is happens. I love the young girls in the rain, that was funny! Yeah, the white Vette in the video was female driven. There was a big Internet hoopla about how in the world did she manage to crash her Vette into the curb while going so relatively slow in a straight line. Yeah, I was sitting here watching it on my phone while my parents were in the room, and didn’t realize some of the language was harsh. That was awkward, but boy did those two girls get on my nerves!!!!!! Remember when the 1990 Corvette ZR-1 hit the market with a “power key”. You could “turn off” 125 hp of the 375 hp for folks who lacked the know how to drive a high performance Corvette. 20+ years later 375 hp seems a bit weak for a Corvette, there’s no “power key” and there are more clueless, totally overmatched people driving these cars than ever. Personally, I think you should be required to obtain some kind of certification to legally drive a car that rolls off the assembly line with more than 500 hp. Maybe it would save a few lives, quite a few cars and offer those who have it a break on auto insurance? I agree LFX, and it should also spread out to people who choose to drive overly excessively large SUVs. But seriously, there are so many people who have the money to go out and buy high HP cars and have no clue how to drive them. Use some of that money to buy some driving lessons.